I like card challenges because they provide a central theme around which to build a card. Since I have so many House Mouse Designs stamps, I tend to participate in the House Mouse and Friends Monday Challenge and the Gruffies & Guest Challenge. 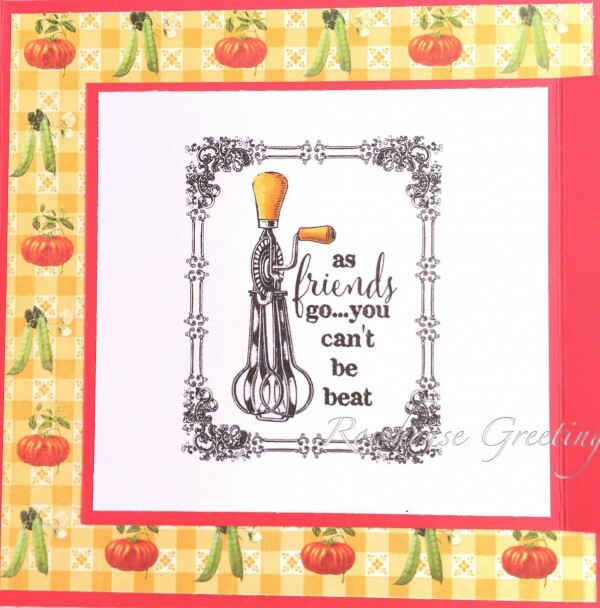 The theme of the current House Mouse Monday Challenge is “In the Kitchen” so it gave me the opportunity to pull some cool vintage style card stock out of my stash and use the new House Mouse stamp “Mix Up” featuring Hop-It and Itty Bit. I really like the vintage feel of the Home Sweet Home Collection by Graphic45, particularly the colorful Farmer’s Market pattern. 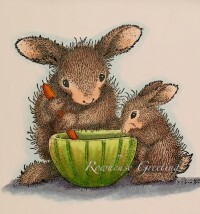 And surely a rabbit’s kitchen would in the garden where there are plenty of melons to use as bowls and carrots for spoons! 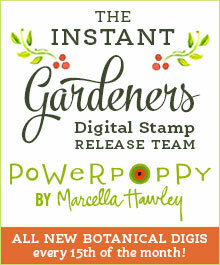 Stamp: House Mouse Designs Mix Up by Stampendous! Embellishments: Jack and Jill Enamel Dots by Echo Park Paper Co.
Next And Perhaps a Little Ice Cream …. Such a sweet image, and you colored it up beautifully. Papers are perfect, and the sentiment too. Beautiful, inside and out. 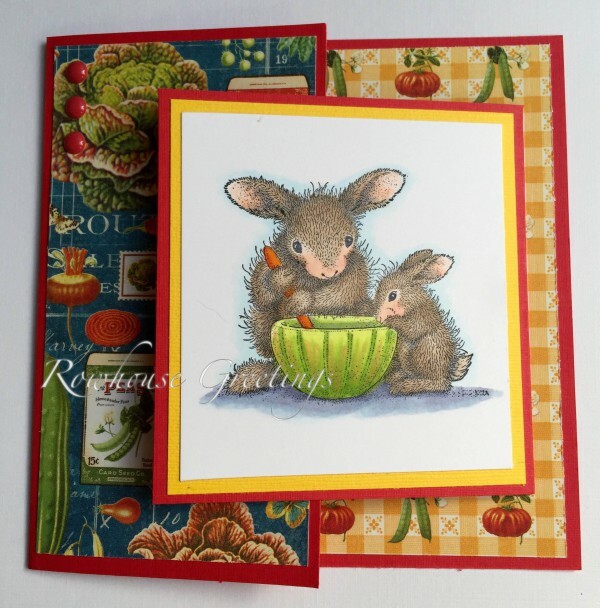 Thanks for joining us for the House Mouse and Friends Monday Challenge, glad you like the HM Designs as much as we do. Such a cute image and some lovely papers you have used . Thanks for joining us for the House Mouse and Friends Monday Challenge and good luck in the draw. Hope to se you for the new challenge tomorrow. 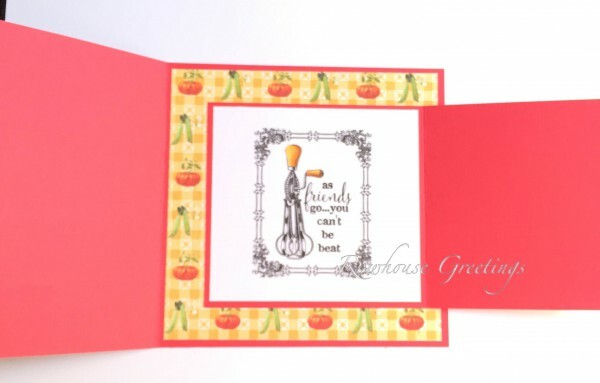 Brilliant card and I love the papers you used … so perfect for the image! ​Thanks for joining us at House Mouse and Friends Monday Challenge. Hope to see you again on the next challenge! Thanks Snoopy! That Graphic 45 paper really pulls it all together. Oh this is FABULOUS…beautifully coloured image and Snoopy is right that paper is simply perfect for this image!! Thanks for sharing with us at House Mouse and Friends…good luck! A fabulous card with a great design and papers…….your cute image is beautifully colour and I just love the inner sentiment and image!! Thanks so much for playing along with <a href="http://housemouse-challenge.blogspot.co.uk/"<House Mouse & Friends Challenge. Awwww Love this cute image One of my favs..I do have a few tho..lol..the design paper is a perfect match fro your theme nice Joy fold card .. Thanks for sharing with us at House Mouse & friends Mon. chall.